Centuries before the Conquistadores and missionaries came to Mexico from Europe the Huichol Indians called the Sierra Madre Mountains their homeland. Historically they lived remotely as subsistence farmers, but the Huichol were also a spiritual people whose ceremonies and rituals formed the center core of their lives. From the time they were children the Huichol learned how to communicate with the spirit world through symbols formed on bowls made of hollowed-out gourds. After spreading a thin layer of beeswax and pine pitch across the bottom, they would press in seeds, shells and stones one at a time, painstakingly using a long needle, to form religiously significant designs. An eagle brought light to the world, ensured good crops and abundant food. Snakes were the spirit animals of the rain goddess. These offering bowls were used as containers for items offered to the gods. When the Franciscans and Jesuits arrived, bringing glass beads as trade items, the art form expanded to include different media – carved wood iguana and jaguar heads, egg-shaped ornaments, ceramic animal figures - and vibrant colors. This was the genesis of the broad expanse of beautiful beaded items being created today by Huichol Indians who have moved to urban Mexican communities because of the advantage this affords them in selling their art. The “urban” Huichol Indians live primarily in Huichol-only villages around cities where they continue to observe their ancient religious practices and culture. Many prefer to wear their colorful native dress rather than modern clothing. Living in these tight-knit communities enables them to keep their indigenous identity. 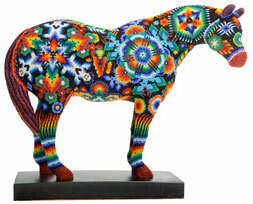 We at The Trail of Painted Ponies were aware of this history when we approached Harry and Ellen March, an Arizona-based couple who are dedicated to the promotion and preservation of Huichol Indian culture through the sale of their art. Since the mid-90s the March’s have been traveling regularly to central Mexico, where they have developed a working relationship with several extended families of Huichol bead artists. When we asked them if they would consider taking a Painted Pony form to Mexico to be beaded in the traditional Huichol style, they felt they knew just the artisans who would rise to the occasion. Gregorio and Graciela Medina live and work in the Huichol colonia of Zitakua, overlooking the city of Tepic, capital of the state of Nayarit in Mexico. They are in their early 30’s and are outstanding artists, producing both traditional and contemporary artwork. No two pieces are identical. Just for The Trail of Painted Ponies, Gregorio and Graciela created an original design that is rich in symbolism and imagination, that is encoded with imagery that dates back to pre-Columbian times, and that documents their spiritual knowledge. “Guardian Spirit” continues our efforts to extend the inspirational power of the horse as a “sculptural canvas” for creative expression across cultural borders.